I never knew they weren’t all Pilgrims. very interesting glimpse into history with a wonderful lesson too. Thanks Nancy. You’re welcome, Jean. I learned a great deal as I researched, and my appreciation for these godly, determined people grew with every fact! Agreed. God has been supremely gracious to our nation, but how much longer? We MUST humble themselves and pray and seek his face and turn from our wicked ways (2 Chronicles 7:14). Thank you for taking the time to comment, Levi. P.S. I WILL have a blessed Thanksgiving–with family for the first time in…ten years, I think! May you enjoy the company of loved ones also–which is even better than the food, right? A little history lesson from you is like Manna from Heaven for me, Nancy! And at Thanksgiving, no less! I, too, had no knowledge that there were people other than Pilgrims making this voyage. 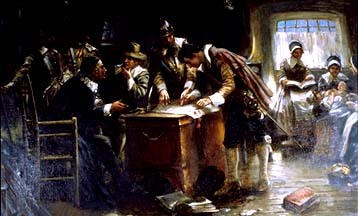 Praise the Lord for His guidance in the drafting of “The Mayflower Compact”! They landed on November 9; it was completed and signed on November 11. Only two days…because most of these were Godly men…seeking His assistance in resolving conflict before it could take hold. I love that it began with ‘In the Name of God, Amen”. How we as a nation have strayed! Thank you, Cheri, for your thoughtful comments. Indeed, we have strayed from the faith-based principles on which the Pilgrims based their colony. I suppose some would argue that those principles no longer apply in the twenty-first century. I wonder if they ever look around to see the consequences of their faith-less philosophies.